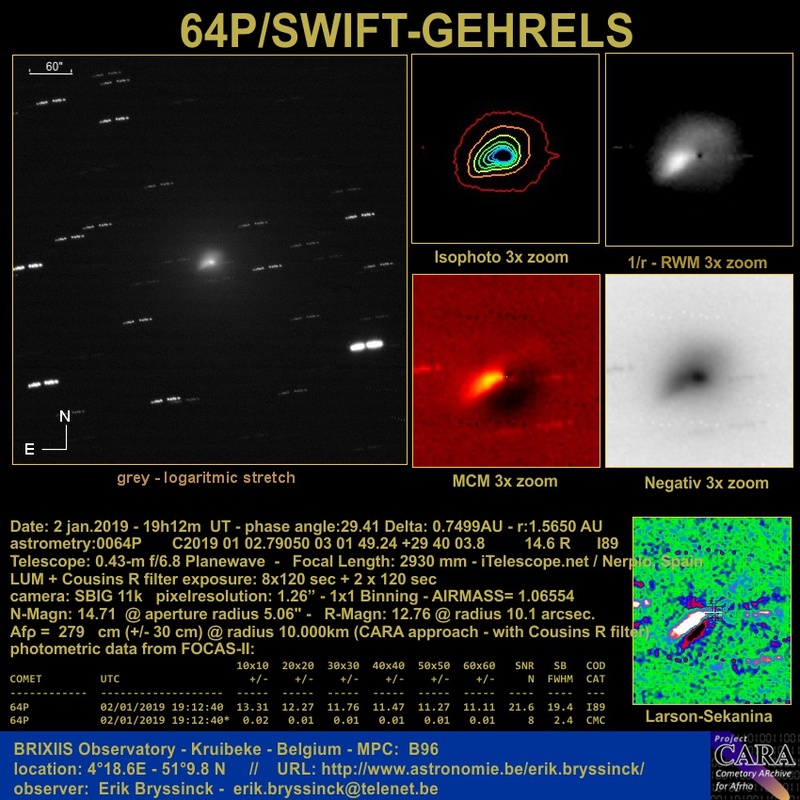 On January 2 and 3 a small outburst was observed By Erik Bryssinck on comet 64P/Swift-Gehrels. Despite the small amplitude of the event it's trace is evident in the changing of the coma morphology. The Af[rho] quantity increased from about 160 cm to 290 cm in R band for measuring windows between 5,000 and 10,000 km. Below the images and plots made by Erik Bryssinck. 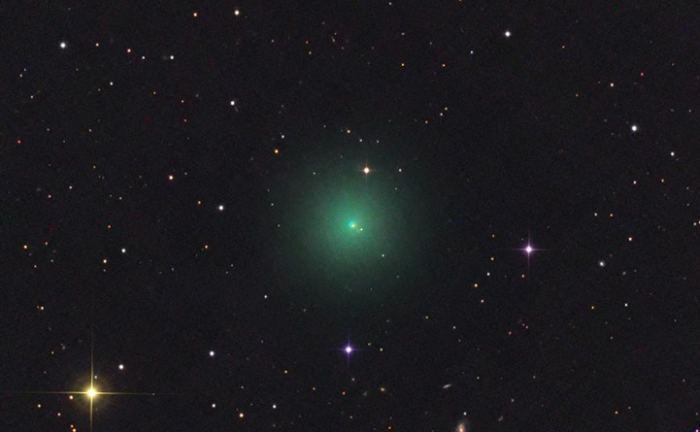 In this period comets 46P/Wirtanen and 64P/Swift-Gehrels are among the more interresting objects. The enclosed plots have been updated by Erik Bryssinck and show the behavior of the two comets reporting the Af[rho] quantity vs. days from perihelion. The observers that are contributing to the observing campaigns are listed below in alphabetical order. The data for 46P have been normalised for a zero phase angle while for 64P have been used the observed values. The recent apparitions of periodic comets 21P/Giacobini-Zinner and 46P/Wirtanen have been intensively monitored. The analysis and the enclosed plots made by Erik Bryssinck well show the preliminary results on the two objects. Comet 21P displayed a regular curve peaking about 18 days before perihelion in agreement with the 1998 apparition (Lara et al, A&A 399- 2003). The CARA data recorded on 67P Churyumov-Gerasimenko are summarized in the enclosed preliminary report in pdf format. The observations concern both the current apparition and all the recorded data by the CARA consortium in the three last apparitions of this comet. An average plot corrected for the solar phase angle is shown. he release 1.9 of Winafro has been released. Go to the "Software downloads" section after logged in.